Please be aware that cheaper CAD cast manufacturing is often substituted for handmade, even if it was specifically requested. The Handmade process makes the metals much harder and stronger metals, but requires much higher skills, more time and consumables. All factories that supply the stock for the vast majority of jewellery shops, have CAD operators and offer custom made services, (mostly made in China and India). From high end and designer jewellers to chain stores, online or bricks and mortar, less than 1% of jewellery is handmade. False handmade claims are illegal but common and growing rapidly, especially online where there is no policing. CAD casting* overseas factories has taken over 99% of jewellery manufacturing. Since 2010 western countries have seen over 90% of their workshops closed, (see Buyer Beware- Jewellers so rare, training to be concluded in Australia). Pic 1. This site claims handmade and actually shows them cutting off casting spru’s. Design faults can result in pieces falling off, stones falling out, etc. Jewellery requires engineering, because we use our hands for everything. Our rings are knocked hundreds of times a week, (thousands in a year), CAD operators, bad jewellers or inexperienced jewellers often don’t understand strength and wear issues that are crucial. Pic 2. Many shops and on-line stores that claim handmade, but use CAD rendered pictures, CAD programs can generate very realistic pictures that fool most people. Real jeweller are very rare today, “fake” jewellers (resellers masquerading as real jewellers) know the easiest way to earn your trust is if you believe they are real jewellers. 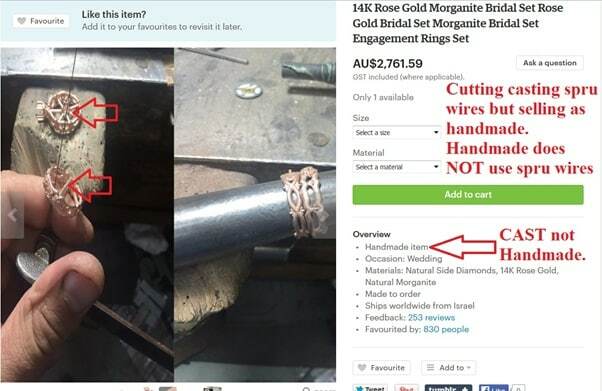 Buyer Beware- Fake jewellers, who are you really buying from. Most valuer’s won’t state how a piece is made, as most can’t tell the difference between cast or handmade, and they are not required to, so this illegal scam goes unreported. If discovered your options greatly depend where you purchased, if online or overseas it is very, very difficult. But purchased in an Australian store the law is on your side, but written proof of the handmade promise is essential. Pic 3. Pic 3. 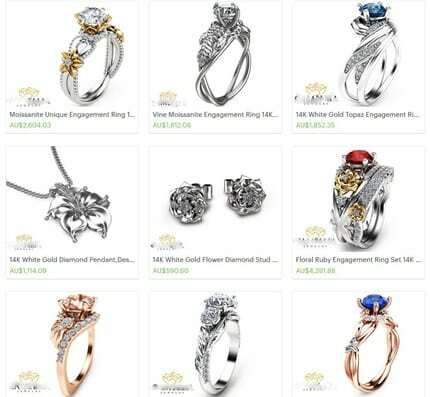 The jeweller on this popular artesian site claims they handmade everything, but lists their hobbies as 3D jewellery designing (CAD), most of their pictures are CAD images and they even show pictures of them cleaning up the castings! *CAD, Computer Aided Design is used to create a 3D mould, which then has to be cast to produce the jewellery pieces, occasionally a slightly different process to create the jewellery piece in used but this also makes the metal with less strong and softer.